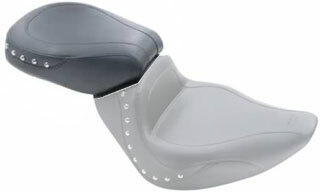 Mustang's Sport Touring seats offer the rider and passenger the comfort of a touring seat with a sporty, stylish look. The rear seat will fit with the 15" Sport Solo and the 14" Solo. Note: Springs and plastic cover must be removed for fitment on the FLSTSB. Fits FXST 2006-2010 & FLSTF 2007-2017 & FLSTSB 2008-2011.